Last year I watched one balloon drift over my apartment complex so low I was sure it was going to land in one of the parking lots. 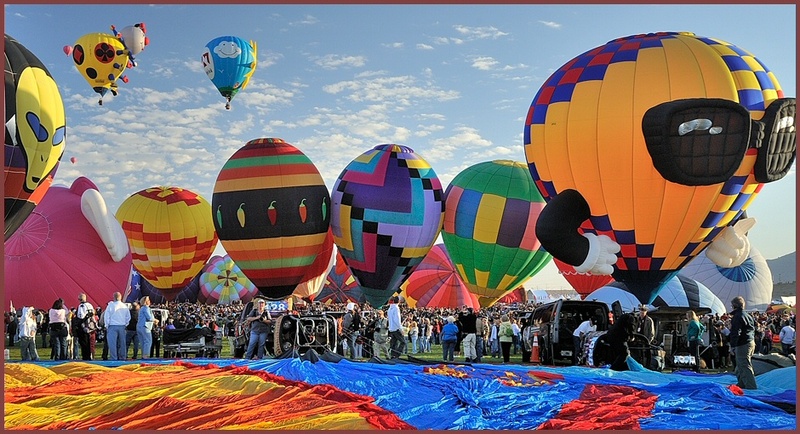 And I live a distance from Balloon Fiesta Park, where it had lifted off. The other night I happened to catch part of a show about the Balloon Fiesta on a local PBS channel. The operators of two balloons, Joey and Lilly Bee (“The Little Bees”), explained how they manage to get both balloons to lift off at the same time, holding hands. Once airborne, Joey and Lilly turn toward each other and kiss before letting go of each other’s hands. These two are a familiar annual sight around here and beloved by enough people that they even have their own Facebook page. Here’s a video of one of the mass ascensions this year. So far our weather’s been good—sunny and cool in the morning, but not too windy. Let’s hope everything continues going up without a hitch this year. There are not many places where can you wander around for days at a time under a sky filled with drifting dots of color. Even if you’re feeling down, you just have to look up. That’s one of the reasons why I love this place.